Unlike a lot of the new startups that appear too good to be true, Lightning Motorcycles was out there from the beginning racing and setting records with their prototypes. After months of near silence following the announcement that they’d try to add world record range to their world record speed run, an image of their “assembly line” appeared on their Instagram yesterday. At least four bikes can be seen currently under construction in what we assume is their San Jose, CA facility, though it certainly looks like a boutique operation still. We have been following the exploits of Lightning since about 2010 when their early prototype bike set a speed record for electric motorcycles of 173+ mph on the Bonneville Salt Flats. CEO and founder Richard Hatfield started small and logically, by buying a Yamaha R1 race bike with a blown motor in 2006 and installing the current best off the shelf batteries and motor in it. By 2012 they had the prototype Lightning, no longer based on a Yamaha, setting 215 mph records at Bonneville, and (not the same bike obviously) winning electric bike road races with the FIM. In 2013 they beat every other motorcycle, gas or electric, to the top of Pike Peak, and last year they announced they were preparing to go after the distance/range record too. But while there was a small media presentation of “the first production LS-218” delivery in 2014, their website has only ever allowed reservations, not pre-orders. Unlike a lot of exotic startups, they at least had an MSRP listed at $38,888, which apparently includes full Ohlins suspension and Brembo brakes. Yes, that is a bit rich, but maybe not when you compare it to a Ducati Panigale, which is fair considering it LS-218 makes nearly the same power, more torque, and has the same quality of componentry. If anything, Lightning has been flipping the script on the typical startup, which is: 1) Market heavily, 2) Make huge claims 3) Deliver little proof. Whoever is running Lightning’s social media (obviously not a professional social media manager) has been very sporadic about posting updates and information, sometime going 90 days without a tweet or Facebook post. But, perhaps this is how it should be? As we recently reported, electric startup Vigo was marketing the hell out of their bike, which doesn’t actually exist yet, in an attempt to raise the funds to build it, and not doing a very good job. The Arc Vector, which also has never been seen running under its own power, can’t even match the performance of the Lightning yet has an MSRP of over $100,000, but at least they have substantial financial backing to build it. We look forward to getting an email soon inviting us to the Bay Area to take a ride on a production Lightning LS-218. 11 Comments on "Lightning LS-218 Electric Super Bike Enters Production"
That is great news! Literally for years have I been pestering the electrek writers for news about Lightning in the comment section under each electric motorcycle article, but never a response, much less an actual article. Serves them right that I read it here first. Speak softly and carry a big stick seem to be their motto. I wish them the best. I might be a customer some day. Looks great. But i’d rather have the available models stretch to cheaper, rather than super high end performance range. Zero’s offerings are pretty expensive still. How about we get Evoke here in California ? This thing is wickedly fast and just plain wicked. Wish I could afford one. The base battery pack claims 100-120 miles of range. The largest battery pack claims 160-180 miles of range. The conditions under which range is quoted are not detailed, but the infographic above also claims “100 miles average range at highway speeds” – presumably referring to the base battery. They say 12-20kwh packs. I doubt at 75 mph it will do 100 miles on the base pack. That would require 8+ m/kWh Seems unrealistic as current sport bikes are in the 40-50mpg rage at that speed. Unfortunately bikes are not that aerodynamic and don’t have the space or weight diet for huge batteries. They’re still vaporware, sorry. Nothing has changed from your last article on them, 1.5 years ago. They made their first, and AFAICS single to date, customer sale ~4 years ago. Does anyone know of any other sale that they made? 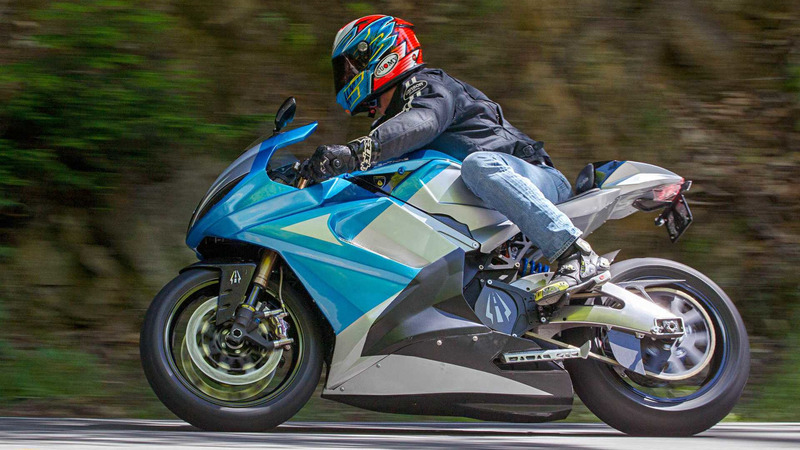 As for “record for the fastest production electric motorcycle” that they blathered about constantly, it later transpired that that high-speed run was made on a different bike than what they showed as a “production” bike (slipstream fairing). (Range of 100-120 miles per charge)” will end up having been measured @ 30mph). And any mention of price is ridiculous, until they actually have multiple bikes delivered & working at that price. IMO, you should have waited until they can show actual production bikes for a story.